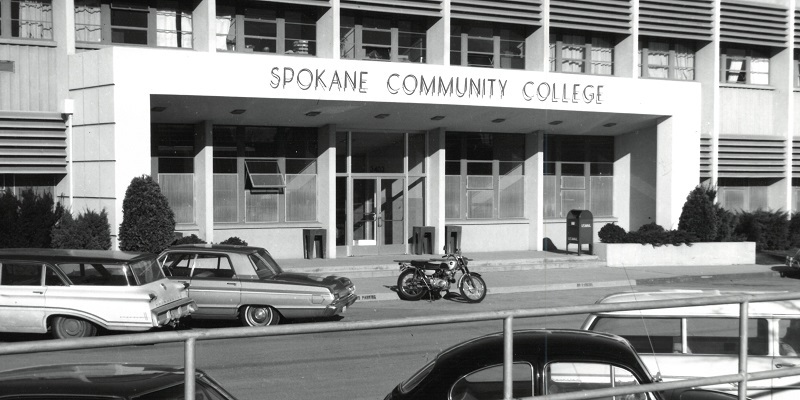 Spokane Community College opened its doors on Sept. 16, 1963 with an enrollment of 1,298 students. Walter S. Johnson was named its first president. The site at Mission Avenue and Greene Street had previously been the Spokane Technical and Vocational School, which opened in 1953. But large community support and a campaign to the State Board of Education brought a community college district to Spokane. Based on industry input, SCC quickly added degree and certificate programs: Photography and hotel-motel management (1964); inhalation therapy and medical record technician (1965); nursing home management (1966); cardiopulmonary technology, construction electrician, construction technology, law enforcement technology and parts merchandising (1967); agribusiness, cosmetology and transportation technology (1968); and associate degree nursing (1969). Liberal arts options for students expanded as well. Drama, bacteriology, physical education and athletics arrived were added in 1964, followed by political science and education (1965); physiology and radio-TV studio production (1966); music and German (1967); agriculture, engineering, recreation, technical report writing and physical science (1968); and in 1969, geology and geography. The college opened with one building (now called the Main Building), and in 1971, construction began on a student center, science building and a physical education complex. By 1977, the campus had grown to house buildings for health care, greenhouse, automotive and trade/heavy equipment programs and had a library and administration buildings. Also, over this time period, SCC built a second campus on Fort George Wright Drive. In 1970, the Board of Trustees separated the Mission and Fort Wright campuses, creating two distinct colleges, SCC and Spokane Falls Community College. In the 1980s, SCC purchased a 40,000-square-foot facility on Fancher Road where 10 SCC apprenticeship and journeyman programs were housed. The number of students served by this facility grew, going from 400 to 700 over an 18-month period. Elsewhere on campus, construction of a 4,480-square-foot day care center, financed by Student Services funds, was approved (1984); a 5,473-square-foot SCC Science Building addition was completed (1986); and in 1987, the State Board for Community and Technical Colleges approved purchase of a 6,000-square-foot hangar at Felts Field for a proposed helicopter repair program, which now houses the aviation maintenance program. By 1985, enrollments topped 6,440 with 215 full-time and 179 part-time instructors as well as 18 full-time administrators. The campus continued to change. The business technology addition to the east of the Main Building was completed in summer 1992, adding 41,517 square feet of new office and classroom space. A Phase II remodeling project was completed in 1994, adding classroom space for architectural technology, civil engineering technology, computer-integrated manufacturing, mechanical engineering technology and liberal arts. In April 2000, degree options for students expanded as trustees approved the addition of an associate of science direct transfer degree at SCC and SFCC. Two types of degrees would be offered - one covering the biological sciences, environmental/earth sciences, chemistry and geology, and the other covering engineering, computer science, physics, and atmospheric sciences. SCC has continued to take on major capital projects (Stannard Technical Education Building 2011) and renovations, like the Main Building renovation scheduled for completion in 2019/2020. The college is currently planning for the new North Spokane Corridor project to come through the west side of campus in the next few years. SCC added its first bachelor of applied science (BAS) degree in 2017, growing the respiratory care program to a four-year degree. Today enrollment is more than 20,000 students per year and there are more than 120 programs to choose from. Programs, and how they are delivered, continue to evolve and grow based on the needs of industry and students.